Our center is equipped with the hardware and software resources to carry out and analyse a wide range of on-line reading experiments and experiments using the visual world paradigm. 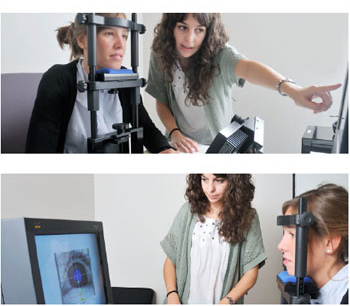 Our Lab has one of the latest and most complete systems for eye tracking: EyeLink 2K (SR Research Ltd.). EyeLink 2K provides an excellent sampling rate (2000 Hz) and is especially suitable for real-time data collection. EyeLink 2K can be used for monocular as well as binocular eye tracking, and the system is perfectly compatible with most contact lenses and eye glasses. This system has a very high average accuracy, down to 0.15º. Many paradigms can be implemented in the EyeLink 2K, such as the visual world paradigm, the boundary technique (parafoveal previews) or silent sentence reading. The EyeLink2K system uses a remote desktop mounting, which allows participants to be liberated of any head-mounted cameras. The EyeLink 2K is also portable, which enables field work to be conducted in other locations than the center, depending on the needs of the test population.